Project Mama Earth is a fascinating band, and with their 2017 debut, Mama Earth, we get to enjoy the fruits of this multi-cultural union. British vocalist Joss Stone is collaborating with a select team of musicians, led by drummer Jonathan Joseph. Comprising of Stone (vocals), Nitin Sawhney (guitar), Jonathan Joseph (drums), Étienne M’Bappé (bass/guitar) and Jonathan Shorten (keyboards). The album has a set of eleven original songs steeped in African, funk, and R&B musical traditions. The project started when British soul singer Stone and her former musical director Joseph hit on the Mama Earth concept of an album driven by the dynamic rhythms of Africa. The whole project is about Mother Nature. The music is full of infectious dynamic singing and dance-ready Afro-pop and soul-infused grooves all framed with Stone’s environmentally conscious lyrics. The album contains six vocal tracks and is rounded out with five instrumental interludes that further showcase the group’s world music-informed connectivity. The music is a wonderful collection of the melding of Cameroonian, Mangambe and Bikutsi rhythms with American funk grooves. Music to feed the soul, and that’s the short of it! Stone’s powerful and soulful singing set to African, funk, and R&B feels with beautiful instrumental interludes. Poetic lyrics that are powerful in self-aware and globally-aware concepts. Each song is separated by an interlude of traditional snippets of the African rhythms and sounds that are contained in the project as a whole. Melody lines that have a plethora of soul and that are sung with such power and control that you would think that this is a wonderful R&B/soul album, but when you add all the African rhythmic influences, you have something very special here. Stone’s lyrics are outstanding. Each song traverses many feels, has many layered instrumental and vocal parts, along with interesting song structures. The playing and singing on these tracks are magical! 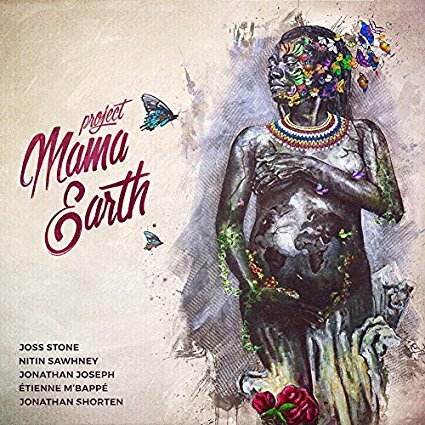 Project Mama Earth is a musical experience that will expand your musical boundaries and feed your heart and soul.